The blog hops are archived at The Stamp Review Crew blog and you'll be able to click through the hops at any time, going directly to the posts as you wish for any of the hops. Just click on the banner of this post to go to the master blog roll for this hop also. If you have already started the hop, you will have come from the lovely and creative Kelly Kent. 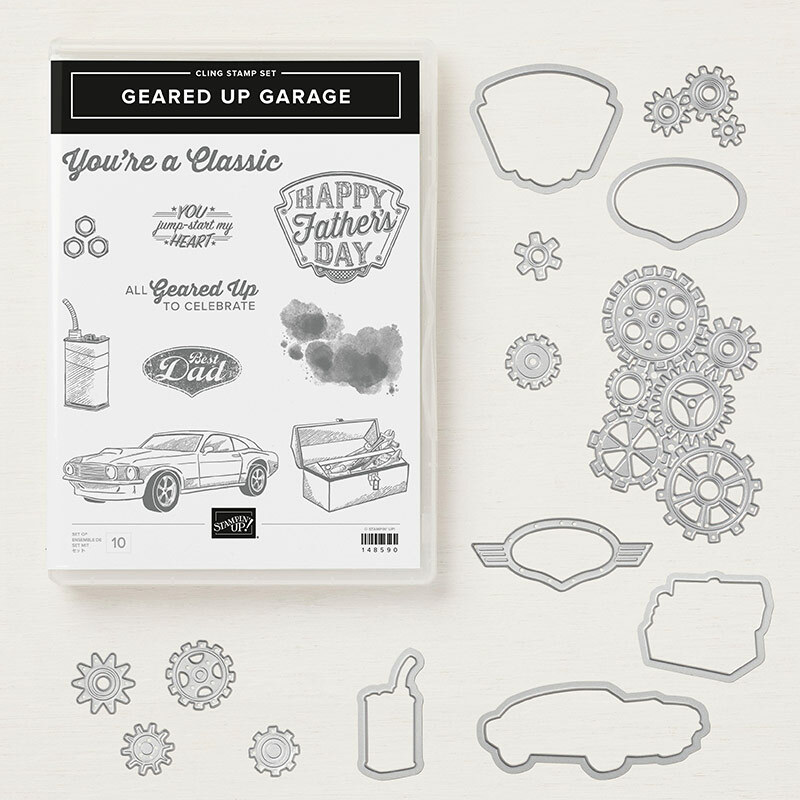 For this hop, we are featuring the Geared Up Garage Stamp Set from the Classic Garage Suite of products. I have made quite a few cards and projects with this stamps set. It's perfect for any masculine themed project. Although, I have seen quite a few feminine ones done as well. I wanted a more textured,, grunged up look, so I roughed up the edges on my Tranquil Tide Cardstock panel. 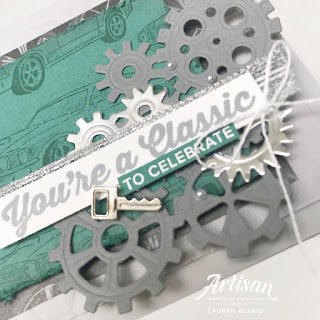 I also wanted to feature those awesome gear dies as well, so I added those to the front. Take a strip of your White Flax Ribbon and press one side down into your Versamark Ink Pad. 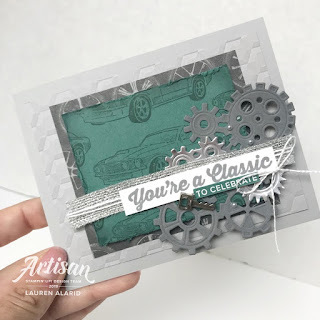 Then, generously sprinkle your Silver Embossing Powder over the inked up side. Lastly, take your Heat Tool and melt the powder, making sure to stop heating it as soon as the powder melts. My guess (though I've not had this happen is that if you heat it too long, it is possible for the ribbon to melt or burn so heat with caution. I also recommend using tweezers to hold the ribbon while you heat it to avoid burning yourself. Super simple, right? Honestly, in the beginning I wasn't sure how it would work out. I was worried the ribbon would melt from my Heat Tool, but it turned out awesome! Well, that's my card for today's hop! Thanks so much for hopping along! Your next stop is my lovely and talented crafty friend Dawn Tidd! Check out her gorgeous blog and projects! Get your friends together and host a party to earn Stampin' rewards during the month of March! Contact me to book an event! Love this, Lauren! All those layers are awesome and that ribbon technique is a great idea. I'll have to give that a try!! So many fun layers... and great masculine colors! Fabulous card, Lauren! 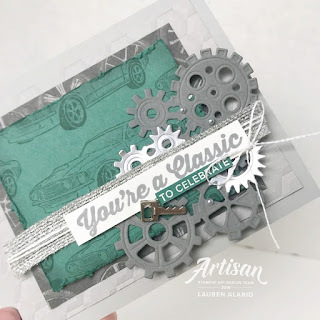 I love all the details...from the layers to the heat embossed ribbon! A perfect masculine card!